Pull apart a greener Christmas cracker this Yule — and skip the cheap plastic tchotchkes within — with Green Planet Parties’ reusable versions. Made with felt and tied on each end with hemp string, the crackers can be purchased empty or with a sustainable toy or organic treat squirreled inside. They’re available in two colors (Earthy Green, Traditional Red) and three designs (Seasonal Stripe, Santa Fun, Forever Trees). Make them a part of your holiday tradition by reusing them year after year, or use a cracker to package a gift within a gift. 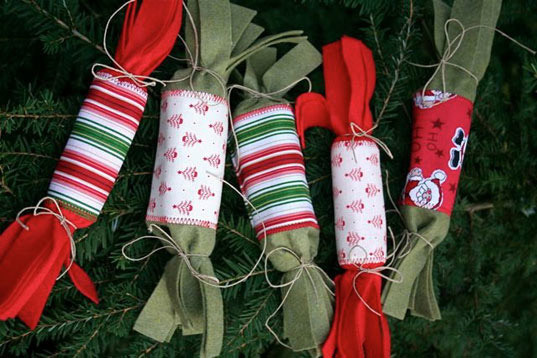 Pull apart a greener Christmas cracker this Yule -- and skip the cheap plastic tchotchkes within -- with Green Planet Parties' reusable versions. Made with felt and tied on each end with hemp string, the crackers can be purchased empty or with a sustainable toy or organic treat squirreled inside. They're available in two colors (Earthy Green, Traditional Red) and three designs (Seasonal Stripe, Santa Fun, Forever Trees). Make them a part of your holiday tradition by reusing them year after year, or use a cracker to package a gift within a gift.